My first "finds" story here on this great site. I have been a Whites kind of guy for the past 8 years, using the DFX to search the beaches here on Maui. But not until February 2011, did I go (finally) into the water. The beaches here on Maui are slowly being well searched by other MD'ers, so the pickings here are ever so slowly being a lot less than before. So I decided to go into the water to better the chances. Most MD'ers here go at night, but I don't like doing that since there is an increase in car break ins. So I go strictly during the day. The first time I got my Excalibur II, I was so impressed with how easy it was to get "used to" the tones and sounds it made. And really I had a lot of success with it. 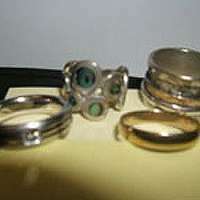 The only thing was that I could NEVER do was to get the coil over something made of gold or platinum (my fault!). I have found a lot of clad coins, silver rings, tungsten carbide rings, stainless rings, even a cobalt ring, but never the above precious metals mentioned. That is until last week. I went to my usual place on the west side of Maui, and after reading a short story from this person named "Seaweed", where he mentioned about how 98% of all coins/jewelry are really from dry sand drops, and that these items would shift constantly from the dry sand, into the water, to the wet sand, to the dry sand then back into the water. It never made any sense until I got what he was trying to say. I hit a pocket of very green coins, mostly clad quarters, and then it hit me that these coins were gathered over the years and then deposited into elongated "pockets", paralleling the shoreline. So I thought that ,Hey, maybe there is more to this than just coins. So I slowed down and dug all of the whispers. 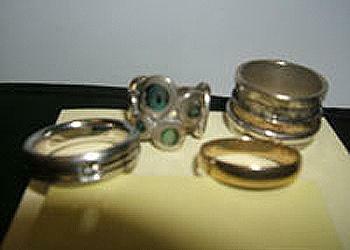 On the second visit, besides more clad coins, I found the small 2.3 gram 10K yellow gold ring (right foreground). WOW! I was so happy to find that! I could tell it was there for a while since it had some sand sticking to it. On the next visit, I found this 18.6 gram diamond platinum ring! (Left foreground) I was so stoked to find that! Even this ring was in great shape, although it did have a couple of rust stains on it (cleaned off really easily though), telling me that it too was there for a while. So to all those who say that all of the good stuff are gone, that there are too many MD'ers out there, so no sense in trying... well... hang in there! Even a blind pig finds an acorn every now and then. This blind pig (from Maui!) did, even after an 11-month dry spell! Oh, and thanks for Minelab for a very fine machine. I love my Excalibur II. Every time I use it, I get better and better. Well, it helps when you start finding gold and platinum, that is!